South Africa’s obligation to protect its natural heritage for future generations will be called into serious question if the government allows a new open-pit coal mine to blasted open on the fence line of Africa’s oldest game reserve and wilderness area. The negative impact on tourism, jobs and the regional economy would also be “incalculable”, the provincial conservation agency Ezemvelo KZN Wildlife warned yesterday in a strongly worded message endorsed by the KwaZulu-Natal Nature Conservation Board. “If this application to mine is granted, it would be a travesty and a serious challenge to the South African government’s obligation as the country’s trustee to protect key natural areas for the enjoyment of current and future generations,” Ezemvelo said, joining the growing chorus of local and international opposition from environmental conservation groups. 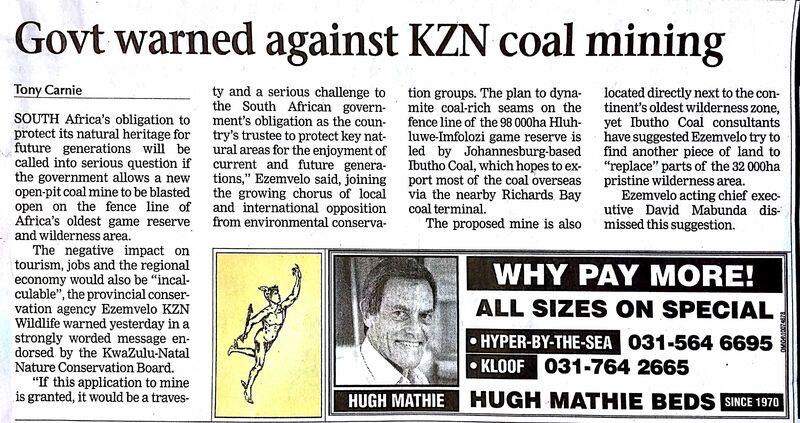 The plan to dynamite coal-rich seams on the fence line of the 98 000 ha Hluhluwe-Imfolozi game reserve is led by Johannesburg-based Ibutho Coal, which hopes to export most of the coal overseas via the nearby Richards Bay coal terminal. 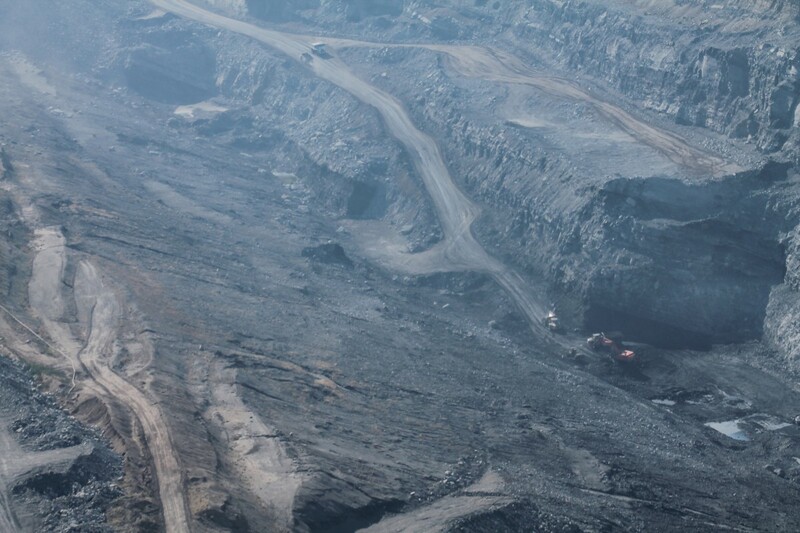 The proposed mine is also located directly next to the continent’s oldest wilderness zone, yet Ibutho Coal consultants have suggested Ezemvelo try to find another piece of land to “replace” parts of the 32 000 ha pristine wilderness area. Ezemvelo acting CEO David Mabunda dismissed this suggestion, noting that Hluhluwe-Imfolozi was established in 1895 to stop the imminent extinction of the southern white rhino. It was the old protected wildlife area in the country, even older than Kruger national park. Mabunda said Ezemvelo was not opposed to mining per se, but in this case the proposed mine could be “devastating” and would have negative effects on the reserve’s character, ambience and sense of place because of the impacts of blasting noise, vibrations, dust, water and light pollution. Responding to questions on why the board of Ezemvelo appeared hesitant to criticise the mining proposal, Ngidi said this was not the case at all. Mabunda’s statements reflected the views of the board. When Ezemvelo drafted a formal press statement earlier this year, the board took the view that there should also be further engagement with Mike Mabuyakhulu, the provincial MEC for Economic Development, Tourism and Environmental Affairs and the national department of Mineral Affairs. The board wished to spell out its opposition to the Ibutho Coal proposal in its current form and Mabuyakhulu had agreed to engage with the national mining department. Ibutho for its part has declined to comment on calls to scrap the project. A shorter, edited version of this article titled”Govt warned against KZN coal mining” appeared in the Mercury on October 8, 2015. Please click on the image below to read.